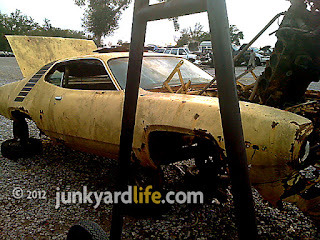 Lemon Twist 1972 Road Runner sold for scrap price to junkyard. Brian B., a hotrodder from Foley, Alabama, sent junkyardlife photos of this fresh find at Barry’s U Pull It junkyard in Mobile, Alabama. There’s no doubt that Brian quickly noticed this Road Runner’s eye-searing, yellow paint and unmistakable strobe roof stripes. 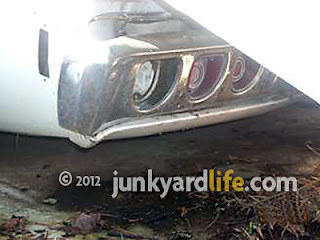 Any would-be-junkyard-junkie knows this car is a valued relic from Mopar’s muscle car past. How this shabby, one-of-7,628 B-Body Road Runners built in 1972 landed in this parts pulling purgatory is anybody’s guess. 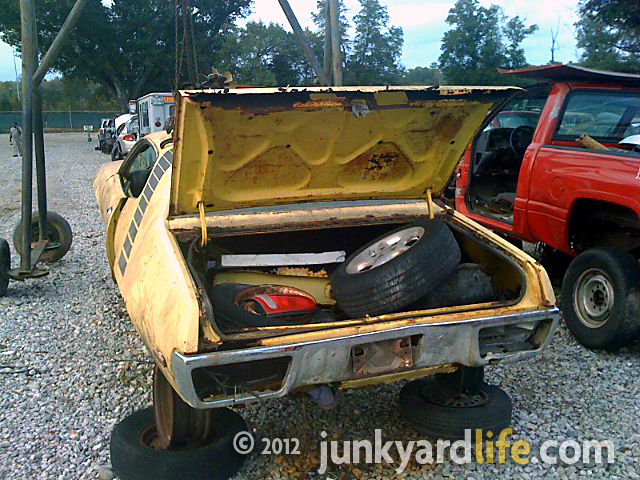 Most cars that land in ‘pull-your-own-parts’ lots are hauled in and sold for scrap prices. 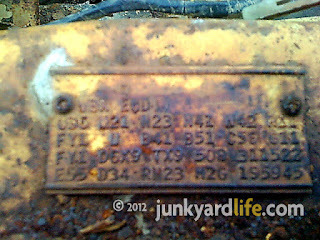 These type yards make a few bucks by charging admission and selling a few parts to do-it-yourselfers. Their inventory is constantly changing because most of the cars are sent to the scrapper in about 60 days. Some yards set aside an area for older vehicles to keep them out of the scrapping rotation until space is needed. 1972 model year and older vehicles appear to be the normal dividing point. Sorry, 1973 Dodge Chargers, its the crusher for you. 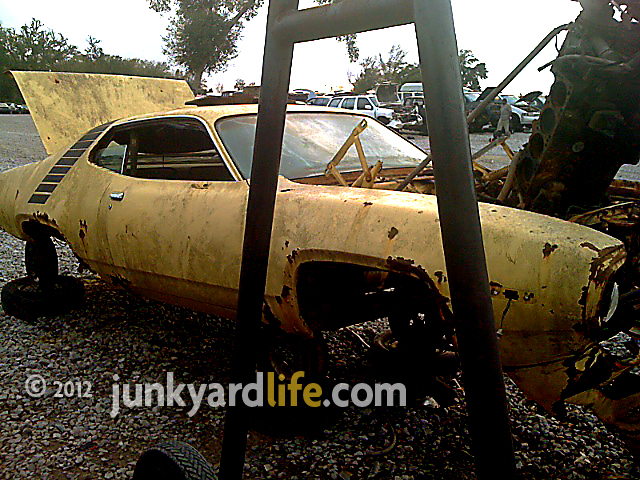 1972 Plymouth Road Runner 340-V8 engine gets yanked home for $163-plus a $40 core charge at this pull-your-own junkyard. Plymouth built 7,628 Road Runners for the 1972 model year. 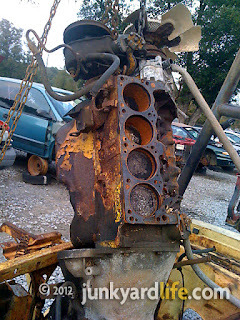 Brian, a regular at south Alabama junkyards, caught a glimpse of the Road Runner’s 340 cu.-inch V8 as it hung above the engine bay. “Someone was pulling the motor when I took the pictures but they weren’t around,” said Brian. The orange engine block, bolted to a TorqueFlight 727 transmission, was plucked using ‘U Pull Its’ enormous engine hoist on wheels. “I’m not well versed in Mopar, but it looked like a small block,” said Brian. The trim tag on the Road Runner’s fender revealed that a 340 cu. inch V8. engine was originally installed in the car at Chrysler’s St. Louis, Missouri plant. For less than $300 the 340-cu. inch engine and 727 transmission now have a new home. That's a nice profit for the junkyard and a good find for a Mopar gearhead. 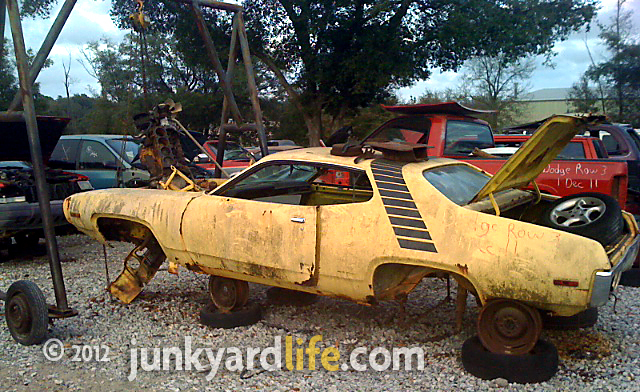 This battered, junkyard Road Runner doesn’t appear to have its factory engine. The small block 340-V8s, painted orange in 1970-’71 and changed to blue in 1972, were an option on the Road Runner which came standard with a 383-V8 engine. The 340 engine originally had a beefy block, big mains, forged-steel crank, forged pistons and heavy duty connecting rods. The heads on the 340 also had big valves until 1972 when performance was zapped across the board throughout the muscle car spectrum. Compression on the Road Runners 340 engine dropped to 8.5:1 as the intake valves shrank from 2.02 to 1.88. A cast iron crankshaft also replaced the forged steel unit mid-year. 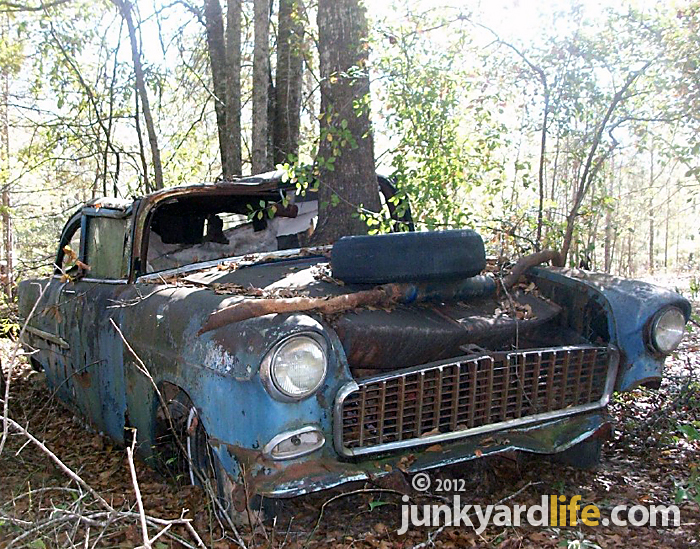 You can recycle your aluminum cans, paper, plastic and glass but don't toss classic cars to the junk man. Try craigslist, ebay or your local newspaper to sell your decaying, four-wheeled friends. All their rare, usable parts will not be saved before they are crushed. You may even make more money along the way to making a car nut happy. The Mopar fender tag reveals many options equipped on this '72 Road Runner. 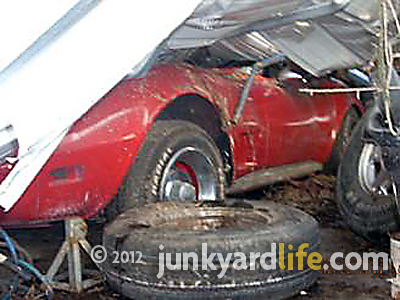 A mid-seventies Corvette and a 1968 Impala convertible rest beneath this wreckage caused by a storm many months ago. Look at this disaster scene I found in west Alabama. 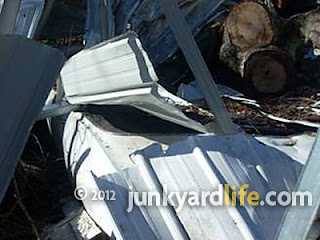 There is no way a car could be under the mangled shed. 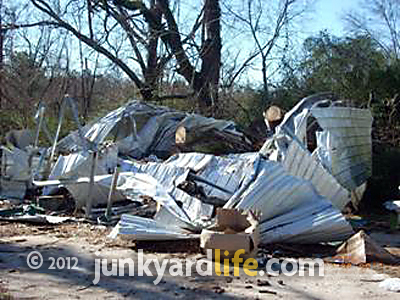 Only there's not one, but two cars under the shed covered by debris left by a storm. Two classic cars, a 1968 Impala convertible and a mid-1970s Corvette, were crushed by falling trees. It also appeared like no one was in a hurry to remove them from the carnage. 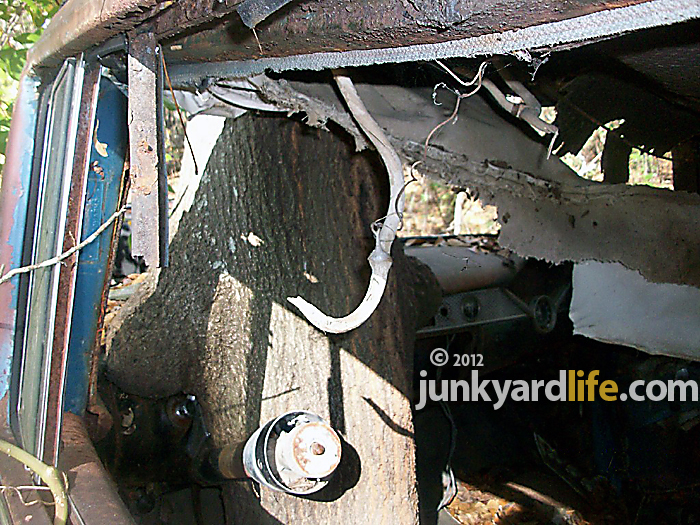 The top of the 1968 Impala convertible is crushed under fallen trees and tin. With over a million cars built on this Chevy's big car platform in 1968 (Biscayne, Bel-Air, Impala and Caprice), only 24,730 were convertibles. That's about 2% of the total build. That’s the numbers I like! "Easy does it, careful with the car," you say. Somehow you evade fate and protect your treasure from millions of potential accidents over several decades as you drive alongside knuckleheads on the highway. You cringe at the idea of parking your car in a parking lot with countless, careless door-openers. "No door-dings, no, sir!" Then, you have the elements to deal with. Rain verses convertible top. The rain usually wins, so you only drive your convertible on sunny days. Then you have the classic case of snow-plus-ice, equals salt on the road. That means certain death of metal. "Harsh sunshine, no!" The chrome-eating, paint-baking sunshine. Through it all, you carefully maintain your “treasure” for future generations to enjoy. You may even add another classic to the collection somewhere down the way. I’m not talking a mini-van. I mean an impractical, world-class, fuel-guzzling, sports car like a Corvette. It too survives many years of potential automotive disasters such as teenagers, prom nights and insurance sales people, you would swear do not want you to have these cars. So what do you do to protect these classics from such dangers? You could build a separate garage to house them. That would be a great idea! Well, that’s what this unfortunate guy thought too. The shelter was no match for these giant trees. Notice the Impala’s Chevy Rally wheel is not body color like the Corvette, it is finished in a polished aluminum look, although the wheel is steel. Also notice the “short” center cap as opposed to the larger “cone” style like on the Vette. The Corvette wheel (in this case) has the center you automatically got when checking off the higher wheel option. Ironically, the short centers were usually found on the Corvette, although an option on any vehicle ordered with Rally Wheels. This example, if you look closely, denotes the Power Disc Brake option. This is a rather rare center piece that promotes (and now celebrates) the first year power disc brakes were offered as a regular production option on the Impala and many other GM master pieces. So what is there to learn from this bad dream? This lesson is simple – make sure-and-double-darned sure, your insurance covers catastrophic events. Don’t give them any reason or loop holes to escape liability for your treasure. It is NOT just an “old car.” It is history and heritage. It is a future inheritance. Don’t let them say “Oh-you didn’t tell us the tree was there” or “the garage and contents thereof are not covered because the garage isn’t connected to the house” or “we only cover this if caused by an angry penguin in an August snow storm in Alabama.” Check and double check the insurance company's agreed value of the vehicles. If your insurer doesn’t offer you a suitable policy, check into collector car insurance. If you have a tree threatening to fall, don’t bet that it won’t. Bet that it will and take it down yourself. Whatever measures you can take to prevent disaster is good and whatever doesn’t happen allows you to sleep a little better. Here is the distinctive rear bumper of the 1968 Impala convertible. Even this sturdy bumper was not made to withstand a garage falling on it. 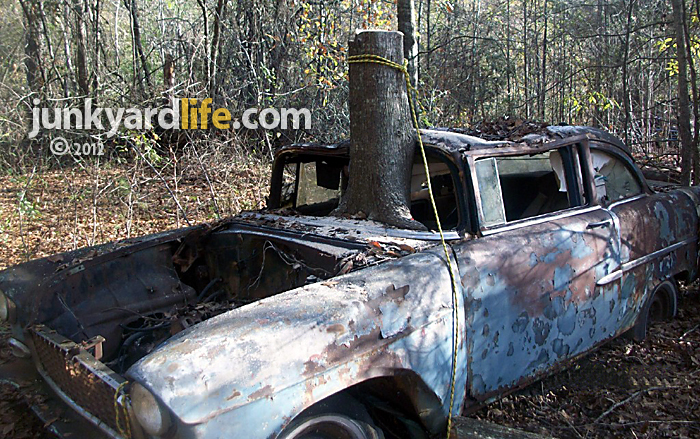 Grab a chainsaw we’re going to pick up a free 1955 Chevy. If only it were that easy for Robert Capps, a 48-year-old gear head from Auburn, Alabama. Capps picked up this freebie, 2-door, blue and white 1955 Chevy 210 after it spent the last 30 years parked outside. 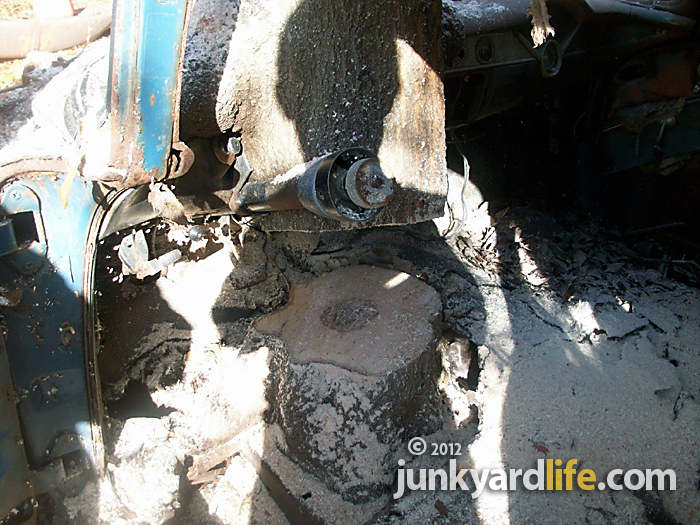 "The car was free, the problem was removing the 30-year-old water oak," said Capps. "It took two people, eight hours using a chainsaw, cutting torch, and a Hi-Lift Jack to remove the car from the oak's firm grip." 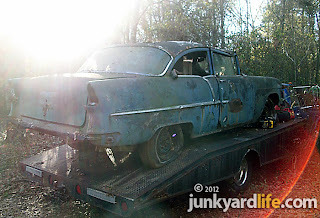 I got a free '55 Chevy growing out back. This tree-hugging '55 chevy was located behind a shop west of Auburn Alabama. "The '55 was one of about sixty '55-'57 Chevys that the shop's owner had collected during the 1980s," said Capps. "During the late 1990s people would steal parts off his cars, so he sold them off." 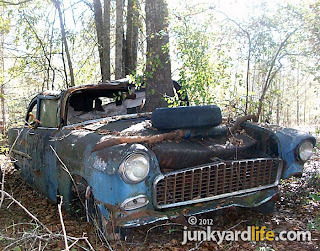 The 1955 Chevy anchored by a water oak was the last one to go, because no one wanted to do the work to remove it, until Capps came along. 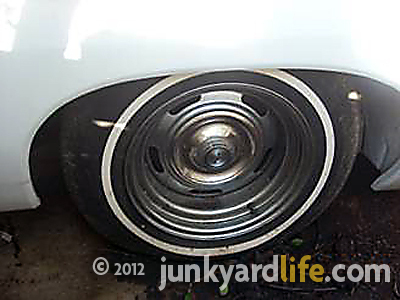 This '55 Chevy might need more than floor pans. "We don’t really know how long the car has been sitting there, but we did count over 30 rings on the tree trunk," said Capps. "At some point, someone had cut a hole in the floor to put a floor shifter. That is where the oak tree started to grow." What you might not be able to see in the photos is that another tree had fallen on the roof decades ago, which broke the front glass out. With the front glass out, the tree had an exit route. Originally the Chevy was equipped with a 265-V8 and a three-speed transmission. A tree-speed was not on the option sheet. It wasn't a total win, the oak refused to let go of the left side of the frame rail and the Thrush Glasspack muffler. "The tree had grown around the left exhaust pipe and the frame rail," said Capps. Cutting a section of the frame was the only way Capps could extract the car and load it onto a car hauler. "The tree trunk pushed the steering column to the left five inches and mashed the steel dash forward four inches." The oak tree gobbled up a few more interior pieces in its path. 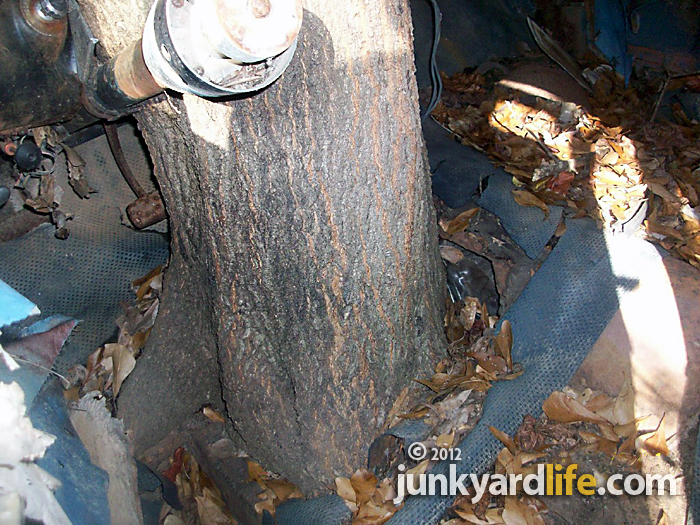 "The speedometer gauge is buried inside the tree. 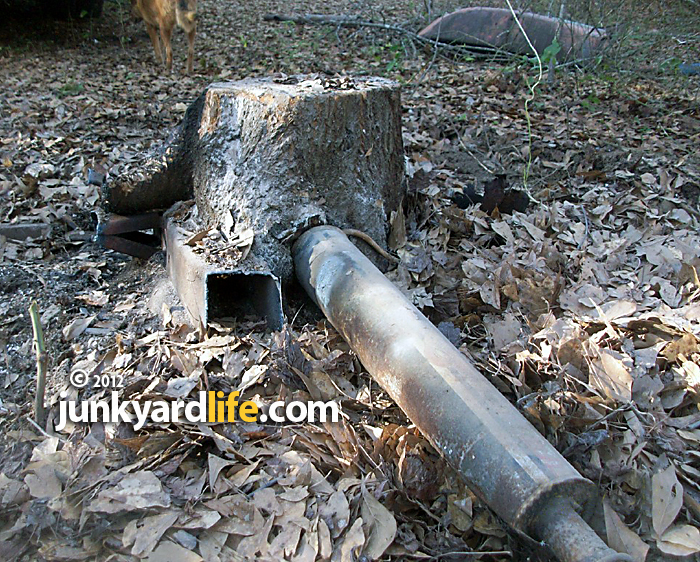 I am told the ignition key should still be in the switch, but it too, is buried inside the tree." A Thrush Glasspack muffler, installed in the 1970s, was claimed by the oak tree that ate a 1955 Chevy. Capps, who also owns a '66 Nova, '53 Ford Customline and a '53 Chevy truck, has no current plans to restore the free '55. "I have started removing all the good parts and storing them inside," said Capps. "I had an idea to make it a 60’s-style gasser, but overall the car is in too bad of shape." Capps plans to explore some other creative ways to salvage the Chevy. "I thought about cutting the back half of the body off and splicing it on the front of a '55 Chevy four-door donor car." For now the old Chevy will not be crushed. "I still don’t know what to do with the dash that has part of an oak tree stuck to it. Maybe I could take the dash to Moultrie, Georgia (swap meet) in February and sell it." The question everybody ask is was it worth all the time and effort for $200 worth of rusty steel? "I guess only a car guy would understand," said Capps. "The answer is always yes." More than 30 rings on the tree trunk embedded in the '55 Chevy. The busted windshield allowed the water oak to grow up, up and away. 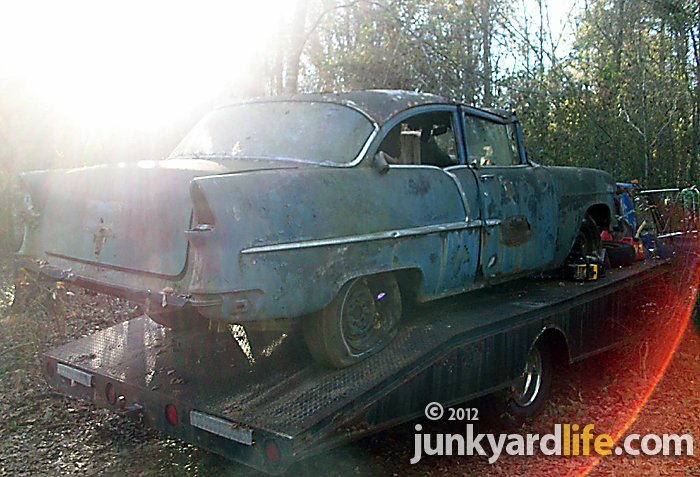 Robert Capps spent the better part of a day rescuing this '55 Chevy.